HeLa whole cell lysate probed with HRP conjugated Rat anti tubulin alpha antibody(MCA77P). Western blot analysis of C6 rat glioma whole cell lysate probed with Rat anti tubulin alpha antibody (MCA77G) followed by HRP conjugated Goat anti Mouse IgG, visualized by chemiluminescence. Rat anti tubulin alpha antibody, clone YL1/2 (MCA77G) used for detection of cytoskeleton in T. brucei. TbRRM1 deficient cells exhibited a nozzle phenotype. (A) Upper: Graphic bars showing the length from nucleus to kinetoplast (N-K; gray bars) or from kinetoplast to posterior end (K-P; black bars) at 0, 24, 48 and 72 h post RNAi induction. Results are expressed as mean ± standard deviation from more than 200 cells at each time point of three independent experiments (Student's t test. *p<0,05; **p<0,01). Bottom: DAPI stained PC. (B) Cytoskeleton analysis of 48 h TbRRM1 silenced cells by immunofluorescence (anti-tyrosinated tubulin YL1/2). From left to right: phase contrast, DAPI stained cells, YL1/2 stained cells and merged images. Scale bar: 3 μm. Depletion of the SR-Related Protein TbRRM1 Leads to Cell Cycle Arrest and Apoptosis-Like Death in Trypanosoma brucei. Rat anti tubulin-α antibody, clone YL1/2 (MCA77G) used for the detection of cytoskeletal elements in Drosophila embryos by immunofluorescence. Spindle abnormalities in embryos derived from imp-α2D14/imp-βKetRE34 and imp-α2D14/imp-βc02473; NLSB−/+ females. (A–D) Wild-type and mutant embryos stained for α-tubulin (green) and DNA (blue). (A) Mitotic spindles in wild-type embryos at metaphase and anaphase. (B, C) Categories of spindle abnormalities found in embryos derived from (B) imp-α2D14/imp-βKetRE34 and (C) imp-α2D14/imp-βc02743; NLSB−/+ females. (D) Formation of aster networks found in both genotypes. Scale bar: 10 μm. (E) Frequency of spindle defects in embryos from both types of mutant females. Female genotypes are displayed at the upper right corner. At least 200 spindles were scored for both genotypes. From: Virágh E, Gorjánácz M, Török I, Eichhorn T, Kallakuri S, Szlanka T, Kiss I, Mechler BM. Specific Cooperation Between Imp-α2 and Imp-β/Ketel in Spindle Assembly During Drosophila Early Nuclear Divisions. Rat anti tubulin-α antibody, clone YL1/2 (MCA77G) used as a loading control for cell lysates using western blotting. Direct detection of the M42 polypeptide. (A) Validation of anti-M42 serum. Lysates from cells transfected with the indicated GFP polypeptides were analysed by SDS-PAGE and western blotting as labeled. (B) Detection of M42 from virus-infected cells. Lysates from cells infected with the indicated viruses at 10 h p.i. were analysed by SDS-PAGE and western blotting as labeled. The same membrane was probed with mouse anti-M2 14C2 and rabbit anti-M42 using different colour secondary antisera; individual grey scale and colour merged images are shown. From: Wise HM, Hutchinson EC, Jagger BW, Stuart AD, Kang ZH, et al. (2012) Identification of a Novel Splice Variant Form of the Influenza A Virus M2 Ion Channel with an Antigenically Distinct Ectodomain. PLoS Pathog 8(11): e1002998. Expression of PpiMHCIIa, PpiMHCIIb1 and PpiMHCIIb2 in the tentacular apparatus. (A) Schematic drawing of the tentacle root in internal view. The three coloured horizontal lines materialise the three different planes of transverse cryosections corresponding to panels D, I, N (in green), E, J, O (in orange) and F, K, P (in purple). (A’) The tentacle root in external view (corresponding to the side of tentacle insertion). The dotted lines delineate the longitudinal dissections to remove tentacle root lateral expansions in order to obtain the preparations shown in (C, H, M). (A”) Schematic drawing of the tentacle root in longitudinal section, after removal of the lateral expansions following the dotted lines in (A’). Horizontal lines indicating the three planes of cryosections as in (A). (B, G, L) Internal views of isolated tentacle roots showing PpiMHCIIa (B), PpiMHCIIb1 (G), PpiMHCIIb2 (L) expressions. (C, H, M) Longitudinal sections of the tentacle root stained with PpiMHCIIa (C), PpiMHCIIb1 (H), PpiMHCIIb2 (M) anti-sense probes. The aboral pole is at the top in panels (B, C, G, H, L, M). (D-F, I-K, N-P) Transverse cryosections of whole-mount ISH for the three genes, with sectioning plane indicated by the colour of the surrounding line according to the colour code outlined in panel (A). The black arrowhead in (G-J) points to a stained line above the median ridge which appears to be more or less in continuity with the two layered bands labelled M Tcl. (Q) YL1/2 (anti-tyrosylated-α-tubulin, in red) and DAPI (in blue) counterstaining of the region boxed in (N). (R) Higher magnification of the region indicated by the box in (Q). (S) YL1/2 (red) and DAPI (blue) counterstaining of the region boxed in (P). (T-W) Expression of PpiMHCIIb1 gene in tentillae. (T) Whole mount ISH of tentacle and tentillae. (U) Higher magnification view of the region boxed in (T). (V) Transverse cryosection of whole-mount ISH of a tentilla. Two symmetrical muscle fibres are stained. (W) YL1/2 (in red) and DAPI (in blue) counterstaining of (V). The YL1/2 staining in colloblasts is certainly due to non-specific fixation of the antibody on the sticky colloblast granules. (X) Schematic drawing of a tentilla in transverse section. Coll: Colloblasts; F tt: Forming tentillae; LR: Lateral Ridge; MR: Median Ridge; M tcl: Tentacle Muscle progenitors; M tt: Tentilla muscle progenitors; Mu: Muscle fibres; N Tcl: Tentacle Neural cells; N tt: Tentilla Neural cells Tcl: Tentacle; Tt: Tentilla. Scale bars: B, C, G, H, L, M: 100 μm; D-F, I-K, N-P: 200 μm; Q: 100 μm; R, S: 10 μm; T: 50 μm; U, V, W: 25 μm. From: Dayraud C, Alié A, Jager M, Chang P, Le Guyader H, Manuel M, Quéinnec E. Independent specialisation of myosin II paralogues in muscle vs. non-muscle functions during early animal evolution: a ctenophore perspective. BMC Evol Biol. 2012 Jul 2;12:107. Rat anti tubulin-α antibody, clone YL1/2 (MCA77G) used for the detection of tubulin expression in the cnidarian Clytia hemisphaerica by immunofluorescence. Distribution of the nerve net in two-day-old planula detected using YL1/2 antibody. (A) Superficial view (optical plane on the basal part of the ectodermal epithelium). (B) Deeper view of the same specimen (optical plane crossing the larval endoderm and cavity). (C) Higher magnification view of the YL1/2 staining (in red) with Dapi counter-staining (in blue) showing the distribution and aspect of nerve cell bodies (white arrowheads) and neurites. Oral pole is on the top for all pictures. Scale bars: A-B, 50 μm; C, 10 μm. 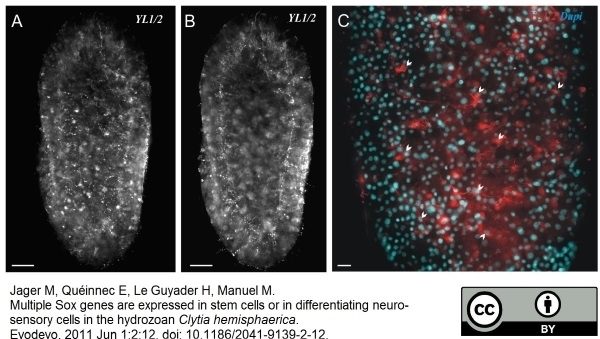 From: Multiple Sox genes are expressed in stem cells or in differentiating neuro-sensory cells in the hydrozoan Clytia hemisphaerica Muriel Jager, Eric Quéinnec, Hervé Le Guyader and Michaël Manuel. EvoDevo 2011, 2:12. Rat anti Tubulin-α antibody, clone YL1/2 (MCA77G) used as a loading control for protein loading in western blotting experiments. An FHA mutation suppresses Tel1 activity but not Mec1 activity during both mitosis and meiosis. A. Phosphorylation of Rad53 protein was analyzed at the indicated time points after phleomycin addition. Rad53 protein was detected by Western blotting by using anti-Rad53 in wild type (W303-1A), xrs2-SH (MSY2199), rad50S (MSY2203), rad50S mec1Δ (MSY2461) and mec1Δ rad50S xrs2-SH (MSY2372). Asterisks indicate phosphorylation signal of Rad53. Tubulin blots are shown as internal control for protein loading. B. Meiosis progression at the indicated time points after SPM transition in wild type (NKY1551), rad50S (MSY1758), xrs2-SH (MSY1867), rad50S xrs2-SH (MSY1844), xrs2-664 (MSY2015), rad50S xrs2-664 (MSY2106) and rad50S tel1Δ (MSY1952). The percentage of cells containing two or more nuclei per ascus (post-MI%) was plotted in the graphs. Images to the right show typical DAPI images after 6 hr of meiosis in each cell line, and the corresponding percentage of post-MI cells for each strain is shown. Scale bar indicates 2 μm. C. Meiosis progression in wild type (NKY1551), xrs2-SH (MSY1867), dmc1Δ (MSY2638) and dmc1Δ xrs2-SH (MSY4674). Typical DAPI micrographs after 6 hr of meiosis in each cell line, with addition of mec1Δ dmc1Δ as a control, are shown to the right. Scale bar indicates 2 μm. D. Phosphorylation of Hop1 at T318 (pT318) at the indicated time points after SPM transition was analyzed in wild type (NKY1551), rad50S (MSY1758), xrs2-SH (MSY1867), rad50S xrs2-SH (MSY1844), xrs2-664 (MSY2015), rad50S xrs2-664 (MSY2106) and rad50S tel1Δ (MSY1952). Hop1 protein was analyzed by western blot with anti-Hop1 (Hop1; green) or with anti-Hop1-pT318 antibody (pT318; magenta), and then each fluorescence signal was detected by laser scanner on the same membrane. Highly mobility shifted band was marked with asterisk. A merged image is shown on the top. Tubulin blots are shown as an internal control for protein loading. E. Localization of Hop1 (red) and Hop1-pT318 (green) on the meiotic nuclear spreads at 4 hr after SPM transition was analyzed in wild type (NKY1551), rad50S (MSY1758), xrs2-SH (MSY1867), rad50S xrs2-SH (MSY1844), xrs2-664 (MSY2015), rad50S xrs2-664 (MSY2106) and rad50S tel1Δ (MSY1952). Scale bar indicates 2 μm. The MRX Complex Ensures NHEJ Fidelity through Multiple Pathways Including Xrs2-FHA–Dependent Tel1 Activation. Rat anti apha-tubulin antibody, clone YL1/2 (MCA77G) used for the detection of tyrosinated tubulin expressing cells in rat neurons by immunofluorescence. Increased microtubule growth in GSK3β depleted neurons is related to decreased CRMP-2 phosphorylation. (A) MAP1B, CLASP2 and CRMP-2 western in CAD cells. (B) Microtubule growth in rat neurons transfected with EB3-mCherry alone (control) or co-transfected with WT MAP1B, ST/AA-MAP1B or ST/DD-MAP1B. (C) Intensity ratios between acetylated and tyrosinated microtubules in growth cones from rat DRG neurons transfected with EB3-mCherry alone (control) or co-transfected with WT MAP1B, ST/AA-MAP1B or ST/DD-MAP1B. (D) Representative images of C. Scale bar: 3 μm. (E) Intensity ratios between acetylated and tyrosinated microtubules in growth cones from rat naïve DRG neurons either non-infected (control) or infected with WT CLASP2, 9S/A-CLASP2 or 8S/D-CLASP2. (F) Representative images of E. Scale bar: 3 μm. (G) Microtubule growth in neurons transfected with EB3-GFP alone (control) or co-transfected with WT CRMP-2, T/A-CRMP-2, or T/D-CRMP-2. (H) Intensity ratios between acetylated and tyrosinated microtubules in growth cones from neurons transfected with EB3-GFP alone (control) or co-transfected with WT CRMP-2, T/A-CRMP-2, or T/D-CRMP-2. (I) Representative images of H. Scale bar: 5 μm. (J) Microtubule growth in naïve neurons from cre+GSK3βwt/wt mice or cre+GSK3βlox/lox mice transfected with EB3-mCherry, or cre+GSK3βlox/lox mice co-transfected with EB3-mCherry and T/D-CRMP-2 (cre+GSK3βlox/lox + T/D-CRMP-2). (K) Intensity ratios between acetylated and tyrosinated microtubules in growth cones from cre&plus;GSK3βwt/wt, cre+GSK3βlox/lox or cre+GSK3βlox/lox transfected with T/D-CRMP-2 (cre+GSK3βlox/lox + T/D-CRMP-2). (L) Representative images of K. Scale bar: 5 μm. All error bars are SEM. *P <0.05. **P <0.01. ***P <0.001. ****P <0.0001. Two-tailed Student's t test. CLASP2, cytoplasmic linker associated protein 2; CRMP, collapsin response mediator protein; DRG, dorsal root ganglia; GSK3β, glycogen synthase kinase 3β; MAP1B, microtubule-associated protein 1B; SEM, standard error of the mean. WT, wild type. From: Liz MA, Mar FM, Santos TE, Pimentel HI, Marques AM, Morgado MM, Vieira S, Sousa VF, Pemble H, Wittmann T, Sutherland C, Woodgett JR, Sousa MM. Neuronal deletion of GSK3β increases microtubule speed in the growth cone and enhances axon regeneration via CRMP-2 and independently of MAP1B and CLASP2. BMC Biol. 2014 Jun 12;12:47. Rat anti tubulin alpha antibody, clone YL1/2 (MCA77G) used as a loading control for immunoblotting analysis of PEDF expression in human joint tissues. Detection of protein levels of PEDF and α-tubulin (loading control) by immunoblot analysis. From: Klinger P, Lukassen S, Ferrazzi F, Ekici AB, Hotfiel T, Swoboda B, Aigner T, Gelse K.
Tissue. Biomed Res Int. 2017;2017:7183516. Rat anti tubulin alpha antibody, clone YL1/2 recognizes the alpha subunit of tubulin, specifically binding tyrosylated Tubulin (Tyr-Tubulin) (Wehland et al. 1983). The epitope recognized by this antibody has been extensively studied and would appear to be a linear sequence requiring an aromatic residue at the C terminus, with the two adjacent amino acids being negatively charged (represented by Glu-Glu-Tyr in Tyr-Tubulin). The antibody has been used in epitope tagging procedures to detect proteins tagged with a C-terminal Gly-Gly-Phe epitope. These sequence requirements have been reported to result in some cross-reactivity with other proteins in certain circumstances, including E. coli rec A and oxidized actin (Burns 1987). 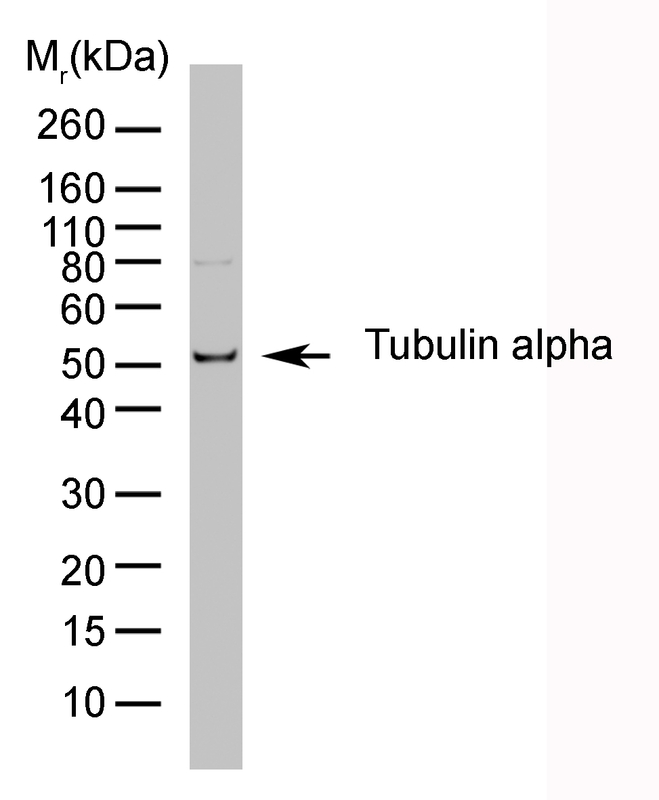 Rat anti tubulin alpha antibody, clone YL1/2 is routinely tested in ELISA on tubulin. Spleen cells from immunized LOU rats were fused with cells of the Y3.Ag.1.2.3 rat myeloma cell line. MCA77P is suitable for use as a loading control. Rat anti tubulin alpha antibody, clone YL1/2 recognizes a band of ~55 kDa in cell lysate from a wide range of species. Rat anti tubulin alpha antibody, clone YL1/2 is suitable for use as a western blotting loading control. MCA77D750 is suitable for use as a loading control. Kilmartin, J.V. et al. (1982) Rat monoclonal antitubulin antibodies derived by using a new nonsecreting rat cell line. J Cell Biol. 93 (3): 576-82. Wehland, J. et al. (1983) A rat monoclonal antibody reacting specifically with the tyrosylated form of alpha-tubulin. I. Biochemical characterization, effects on microtubule polymerization in vitro, and microtubule polymerization and organization in vivo. J Cell Biol. 97 (5 Pt 1): 1467-75. Mol Biol Cell. 21 (17): 2996-3006. Wehland, J. et al. (1984) Amino acid sequence requirements in the epitope recognized by the alpha-tubulin-specific rat monoclonal antibody YL 1/2. EMBO J. 3 (6): 1295-300. Burns, R. (1987) Cytoskeleton. Tubulin's terminal tyrosine. Skinner, R.H. et al. (1991) Use of the Glu-Glu-Phe C-terminal epitope for rapid purification of the catalytic domain of normal and mutant ras GTPase-activating proteins. J Biol Chem. 266 (22): 14163-6. Abe, Y. et al. (2010) A single starfish Aurora kinase performs the combined functions of Aurora-A and Aurora-B in human cells. J Cell Sci. 123: 3978-88. Cheishvili, D. et al. (2011) Involvement in Cytoskeleton Regulation and Implication for Familial Dysautonomia. Hum Mol Genet. 20: 1585-94. Berrueta, L. et al. (1998) The adenomatous polyposis coli-binding protein EB1 is associated with cytoplasmic and spindle microtubules. Proc Natl Acad Sci U S A. 95: 10596-601. Bruce, E.A. et al. (2010) The Rab11 pathway is required for influenza A virus budding and filament formation. Jager, M. et al. (2008) Insights into the early evolution of SOX genes from expression analyses in a ctenophore. J Exp Zool B Mol Dev Evol. 310: 650-67. Wise, H.M. et al. (2011) Overlapping signals for translational regulation and packaging of influenza A virus segment 2. Nucleic Acids Res. 39: 7775-90. Zenner, H.L. et al. (2011) Analysis of Rab GTPase-Activating Proteins Indicates that Rab1a/b and Rab43 Are Important for Herpes Simplex Virus 1 Secondary Envelopment. Timm, T. et al. (2011) Microtubule affinity regulating kinase (MARK) activity in living neurons examined by a genetically encoded FRET/FLIM based biosensor: Inhibitors with therapeutic potential. J Biol Chem. 286: 41711-22. Virágh, E. et al. 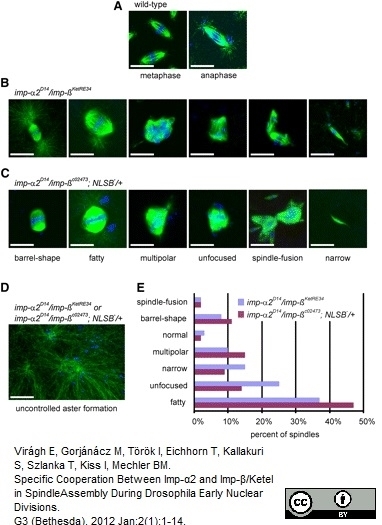 (2012) Specific Cooperation Between Imp-α2 and Imp-β/Ketel in Spindle Assembly During Drosophila Early Nuclear Divisions. G3 (Bethesda). 2 (1): 1-14. Courtois, A. et al. (2012) The transition from meiotic to mitotic spindle assembly is gradual during early mammalian development. J Cell Biol. 198: 357-70. Feau, S. et al. (2013) SLAT Regulates CD8+ T Cell Clonal Expansion in a Cdc42- and NFAT1-Dependent Manner. Wise, H.M. et al. (2012) Identification of a novel splice variant form of the influenza A virus M2 ion channel with an antigenically distinct ectodomain. Dayraud, C. et al. (2012) Independent specialisation of myosin II paralogues in muscle vs. non-muscle functions during early animal evolution: a ctenophore perspective. BMC Evol Biol. 12: 107. Ligon, L.A. et al. (2003) The microtubule plus-end proteins EB1 and dynactin have differential effects on microtubule polymerization. Mol Biol Cell. 14: 1405-17. Smertenko, A.P. et al. (2008) The C-terminal variable region specifies the dynamic properties of Arabidopsis microtubule-associated protein MAP65 isotypes. Li, Y. et al. (2010) The type II Arabidopsis formin14 interacts with microtubules and microfilaments to regulate cell division. Brunk, K. et al. (2007) Microcephalin coordinates mitosis in the syncytial Drosophila embryo. J Cell Sci. 120: 3578-88. Gordon-Weeks, R. et al. (2003) Restricted spatial expression of a high-affinity phosphate transporter in potato roots. Bodor, D.L. et al. 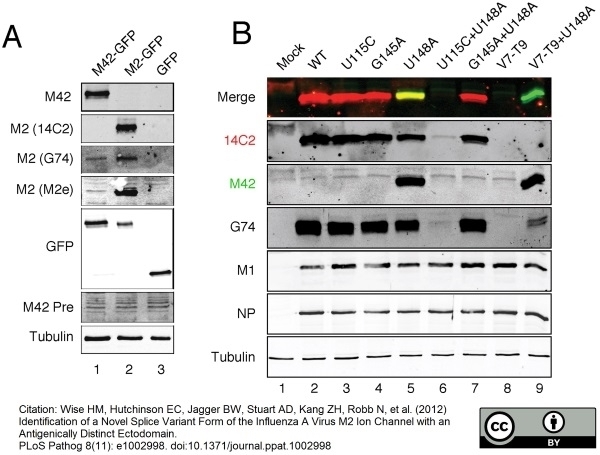 (2013) Assembly in G1 phase and long-term stability are unique intrinsic features of CENP-A nucleosomes. Mol Biol Cell. 24: 923-32. De Faveri, L.E. et al. (2013) Putative tumour suppressor gene necdin is hypermethylated and mutated in human cancer. Br J Cancer. 108: 1368-77. Machado, E. et al. (2007) Prostaglandin signaling and ovarian follicle development in the silkmoth, Bombyx mori. Insect Biochem Mol Biol. 37: 876-85. Meseroll, R.A. et al. (2012) Septin ring size scaling and dynamics require the coiled-coil region of Shs1p. Mol Biol Cell. 23: 3391-406. Vafopoulou, X. (2009) Ecdysteroid receptor (EcR) is associated with microtubules and with mitochondria in the cytoplasm of prothoracic gland cells of Rhodnius prolixus (Hemiptera). Arch Insect Biochem Physiol. 72: 249-62. Levy, G.V. et al. 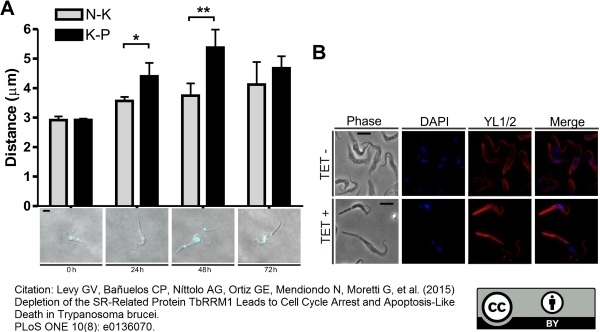 (2015) Depletion of the SR-Related Protein TbRRM1 Leads to Cell Cycle Arrest and Apoptosis-Like Death in Trypanosoma brucei. PLoS One. 10 (8): e0136070. Iwasaki, D. et al. (2016) The MRX Complex Ensures NHEJ Fidelity through Multiple Pathways Including Xrs2-FHA-Dependent Tel1 Activation. PLoS Genet. 12 (3): e1005942. Zasadil, L.M. et al. (2016) High rates of chromosome missegregation suppress tumor progression but do not inhibit tumor initiation. Mol Biol Cell. 27 (13): 1981-9. Vafopoulou, X. & Steel, C.G. (2012) Cytoplasmic travels of the ecdysteroid receptor in target cells: pathways for both genomic and non-genomic actions. Front Endocrinol (Lausanne). 3: 43. Vafopoulou, X. & Steel, C.G. (2016) Mitochondria and the insect steroid hormone receptor (EcR): A complex relationship. Turnbull, M.L. et al. (2016) The Role of the B-Allele of the Influenza A Virus Segment 8 in Setting Mammalian Host Range and Pathogenicity. Vargas, P. et al. (2016) Innate control of actin nucleation determines two distinct migration behaviours in dendritic cells. Nat Cell Biol. 18 (1): 43-53. Kerr, G.W. et al. (2016) PP2A(Cdc55)'s role in reductional chromosome segregation during achiasmate meiosis in budding yeast is independent of its FEAR function. Schlicher, L. et al. (2016) SPATA2 promotes CYLD activity and regulates TNF-induced NF-κB signaling and cell death. Gholkar AA et al. (2016) Fatostatin inhibits cancer cell proliferation by affecting mitotic microtubule spindle assembly and cell division. J Biol Chem. Aug 12 [Epub ahead of print]. Takáč, T. et al. (2016) Actin depolymerization-induced changes in proteome of Arabidopsis roots. Kono, K. et al. (2016) Plasma membrane/cell wall perturbation activates a novel cell cycle checkpoint during G1 in Saccharomyces cerevisiae. Proc Natl Acad Sci U S A. 113 (25): 6910-5. Koparir, A. et al. (2015) Novel POC1A mutation in primordial dwarfism reveals new insights for centriole biogenesis. Hum Mol Genet. 24 (19): 5378-87. Liz, M.A. et al. (2014) Neuronal deletion of GSK3β increases microtubule speed in the growth cone and enhances axon regeneration via CRMP-2 and independently of MAP1B and CLASP2. Jonasson, E.M. et al. (2016) Zds1/Zds2-PP2ACdc55 complex specifies signaling output from Rho1 GTPase. J Cell Biol. 212 (1): 51-61. Nunan, R. et al. (2015) Ephrin-Bs Drive Junctional Downregulation and Actin Stress Fiber Disassembly to Enable Wound Re-epithelialization. Cell Rep. 13 (7): 1380-95. Gaudet, A.D. et al. (2015) Galectin-1 in injured rat spinal cord: implications for macrophage phagocytosis and neural repair. Mol Cell Neurosci. 64: 84-94. Klinger, P. et al. (2017) PEDF Is Associated with the Termination of Chondrocyte Phenotype and Catabolism of Cartilage Tissue. Biomed Res Int. 2017: 7183516. Gao, L. et al. (2017) Afadin orients cell division to position the tubule lumen in developing renal tubules. J Comp Neurol. Jan 11 [Epub ahead of print].